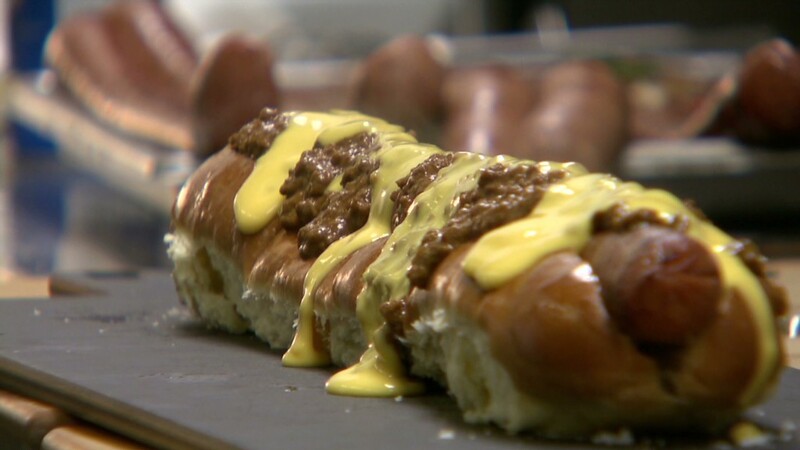 What started as a novel food experiment at Rangers Ballpark in Arlington, Texas has turned into a super-sized food franchise -- all centered around a two-foot-long hot dog affectionately known as the "Boomstick." Named after the bat used by Texas Rangers slugger Nelson Cruz, the $26 Boomstick is a 2-foot all-beef hot dog, smothered in chili, nacho cheese, jalapenos and caramelized onions, all on top of a massive potato bun. The whole thing weighs in at 3 pounds. The ballpark sold nearly 20,000 of the monster hot dogs during the 2012 season — the Boomstick's inaugural year — raking in an estimated $500,000 in sales. "We knew it was going to be a fun novelty type item, but it just really took off," said Shawn Mattox, the general manager for Delaware North Sportservice, which runs food operations at Rangers Ballpark in Arlington, Texas. "It quickly became a fan favorite." After a large hot dog dubbed the Texas Rangers "Big Dog" sold well during 2011 playoffs, Mattox's team decided to top that, with the 24-inch beast. "'We're Texas,' I said. 'I want to have the biggest hot dog,'" Mattox recalled telling his staff. They hit a roadblock when they discovered that they couldn't find a company that made hot dogs -- and buns -- so large. Not to be stopped, they partnered with a local food services company and a bakery to custom make the super-sized hot dogs and buns. The Boomstick was so popular that Delaware North introduced the giant hot dog at six other MLB stadiums for the month of July under the name the "Giant Slugger." To build upon the Boomstick's success, Rangers Stadium will sell Boomstick lapel pins and plush toys. And a "24"-themed food stand will be opened, featuring a variety of super-sized menu options. The Boomstick will be joined by the "Totally Rossome" Boomstick ($32), named after Rangers relief pitcher Robbie Ross, which is smothered with smoked brisket, fresh pico, sour cream and Doritos chips. Also on the menu is a whopping 24-ounce bacon burger ($26), a 24-inch sausage ($26), a 24-inch pretzel ($13) and a 24-inch quesadilla ($26) covered with brisket and served on a bed of nacho cheese Doritos. "When we first started talking about it, I was like gosh that's a lot of meat," Mattox said of the 1-pound burger topped with 8 ounces of bacon, grilled onions and cheese, dubbed "The Beltre Buster" after Rangers third baseman Adrian Beltre. Mattox said he's not sure what the massive eats come in at nutrition-wise, but acknowledged it's got to be close to a day's worth of calories. While some brave fans may attempt to tackle the food alone -- as one who devoured a Boomstick in less than four minutes did in an eating contest last year -- Mattox said the "24" menu items are really meant to be shared among friends or family. "There are those that have the badge of honor and will over the course of several innings eat the whole thing," he said. "God bless them, but it's not really designed for that."